This week author/illustrator, Jo Linsdell, is visiting with us. Jo, can you please tell us a little about you? Tell us about your book, Out And About At The Zoo. My latest project is a rhyming children's picture book OUT AND ABOUT AT THE ZOO for which I am both the author and illustrator. 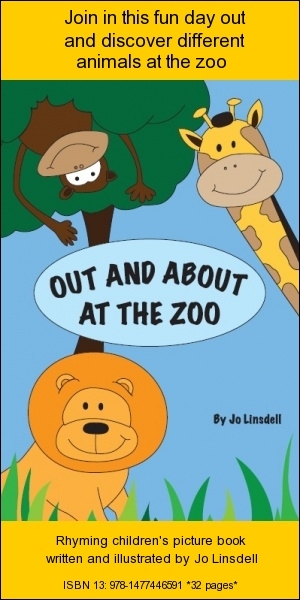 The book follows a child on a day out with his mum to the zoo discovering all the different animals. I'd love to say how healthy I am and list only fruit and veg but my idea of a balanced diet is a bar of chocolate in each hand. So 1) Chocolate 2) sweets (my favourites are jellies and marshmallows). 3) Crisps for those odd days when my sweet tooth has had enough. 1) Enjoy your childhood and don't be in a hurry to grow up. You'll miss it once it's gone. 2) Learn as much as you can. The more you know, the more possibilities you'll have in life. I used to change my mind about twice a day :) The one's that I was most stuck on though were 1) Writer 2) Actress 3) Artist. I've always been the creative type. Jo, where can our tech-savvy readers go to keep up with you and your work, besides Italy, of course (which I'd LOVE to do)? Thank you for visiting with us on this week’s Three Times A Charm. Best of luck with your writing, Jo! 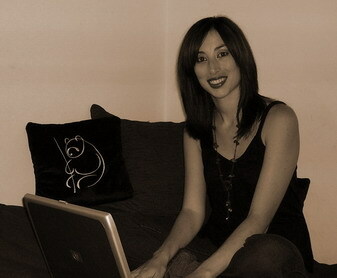 Love the new look of the blog and wonderful interview. Thanks Virginia, it is surprising how hard it is to pick a new look! Scary to think an 11 year old can do something like but even more so that parents and airport staff didn't prevent it. That crafty little kid. I wonder if he knew what he was doing. Thanks for visiting the blog. It was fun getting to know you. You are always welcome! I love the TOP 3 idea. How cute and clever--I'm having one of those, "I WISH I WOULD HAVE THOUGHT OF THAT" moments. And it was fun reading about Jo. Out and About at the Zoo cover is SO CUTE! Lol, thanks Margo! It's a fun interview format that is easy for me and my guests. Always a good thing! Thanks for stopping in to hear more about Jo.